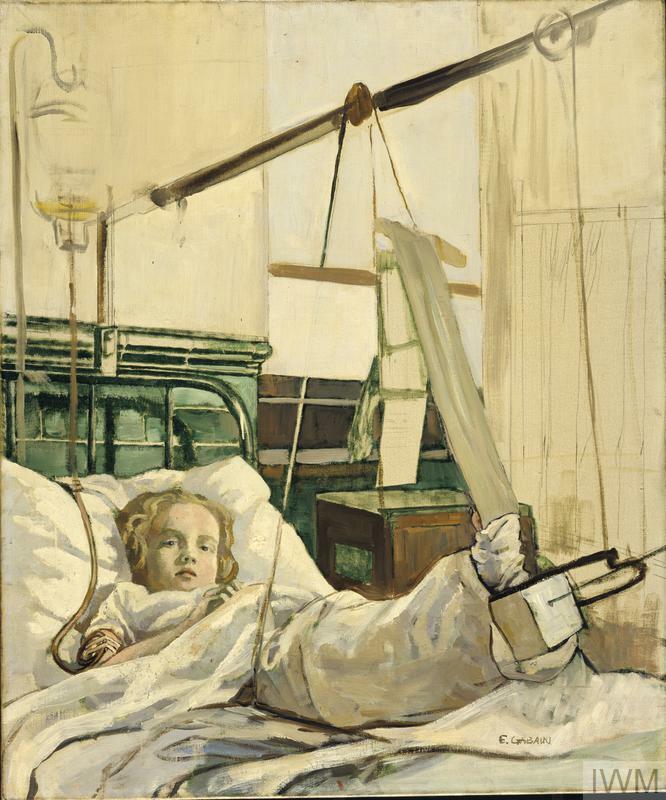 image: A child in a hospital bed with a drip attached to their arm and their leg is raised in a support. 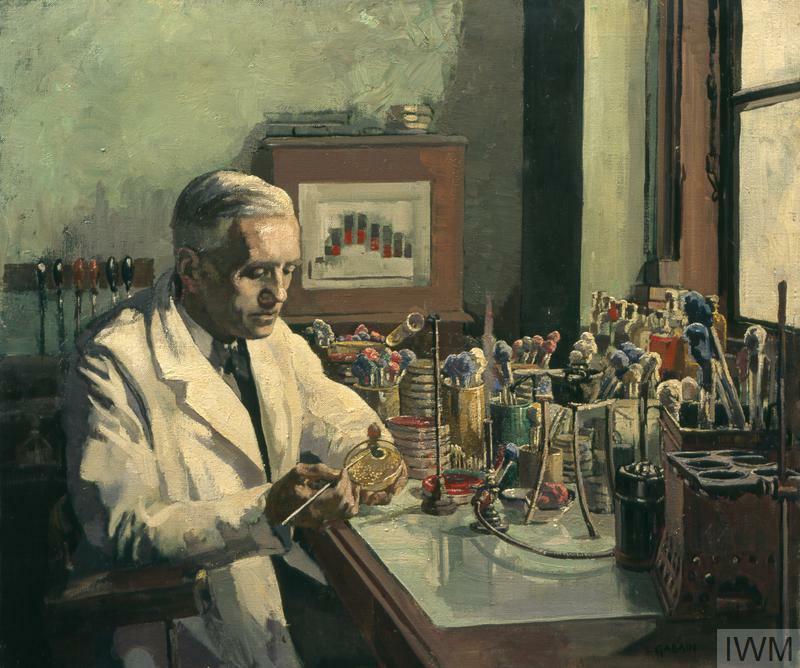 Ethel Gabain suggested the subject of Alexander Fleming, the discoverer of penicillin, to the War Artists Advisory Committee and was duly commissioned in 1944. 'It is miraculous what penicillin has done,' she wrote to the committee. 'It has saved numberless lives on all the battle fronts, and everyday it is becoming more potent as a saver of life - it seems a thing so worthy of record in all the destruction of war'. 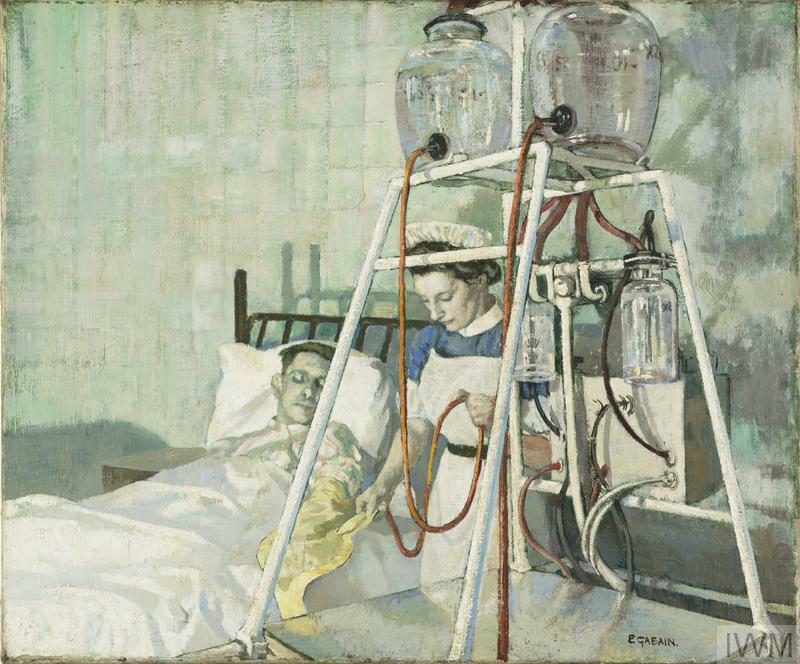 Whilst working on the portrait, Fleming took her around the treatment wards and she proposed the further idea of recording penicillin's clinical use. It seems from the Gabain correspondence file that she was commissioned in 1944 to paint a child bomb victim in hospital. It may be that she assumed the child was a bomb victim, but the key importance of the work was the use of penicillin. 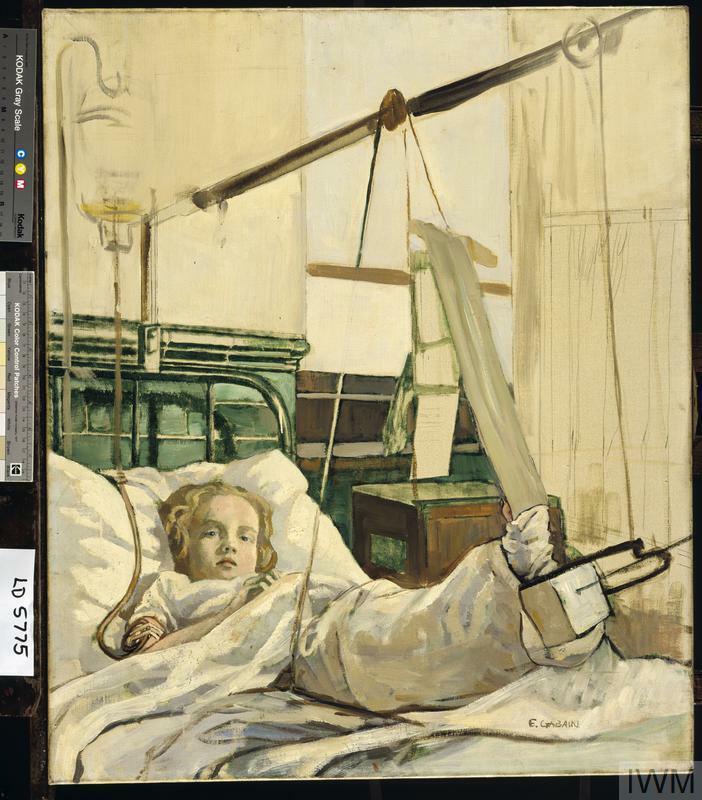 She began the painting which was never completed as the child was later moved to the country and the special equipment which had been set up by the hospital carpenter was dismantled. The sitter was Gillian Samuel. 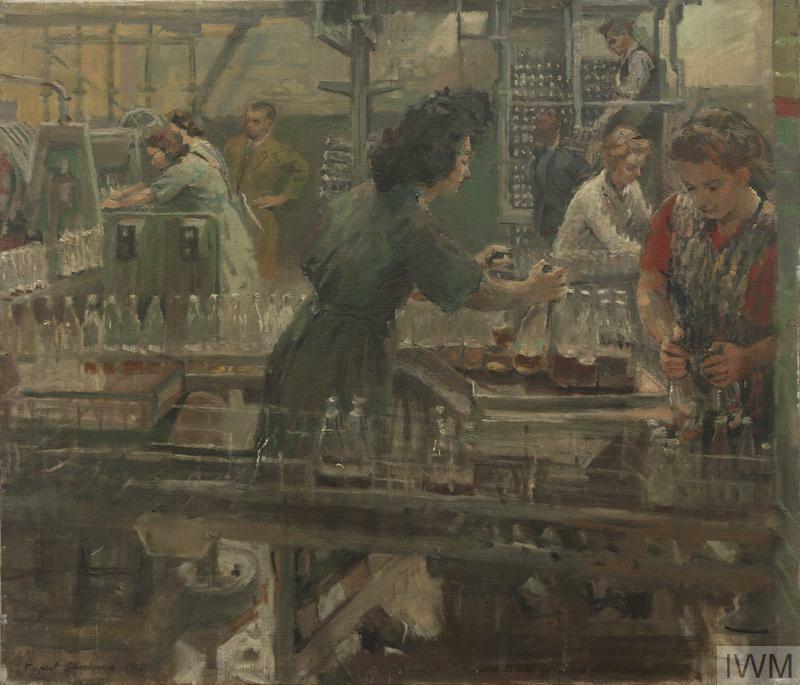 She later stated that contrary to the painting’s title she was not a bomb victim, but had been knocked down in a road accident. Initially the doctors thought that her leg would have to be amputated but her mother had heard of the experimental penicillin treatment developed by Alexander Fleming. She pushed for her daughter to receive the treatment and she was one of a small number of patients to be experimentally treated. She spent a year in hospital, unable to be evacuated despite the V-bombs and then later in the country to convalesce. Her father got to know Alexander Fleming well as he would check on her progress over the weeks. She herself remembers Fleming as an ‘old’ man who came to see her frequently. Gabain's image of the child being treated with penicillin shows her isolated, amid weights and levers and drips that balance and sustain her. However, the overall impression here is of someone safe, protected and, as she engages the viewer, hopeful. Penicillin saved her leg from amputation. This was one of a series of paintings commissioned to display scientific developments. Gabain had lost a child during the war and was herself in poor health when she undertook the commission.